Dots and stripes make for a cheerful pattern play. 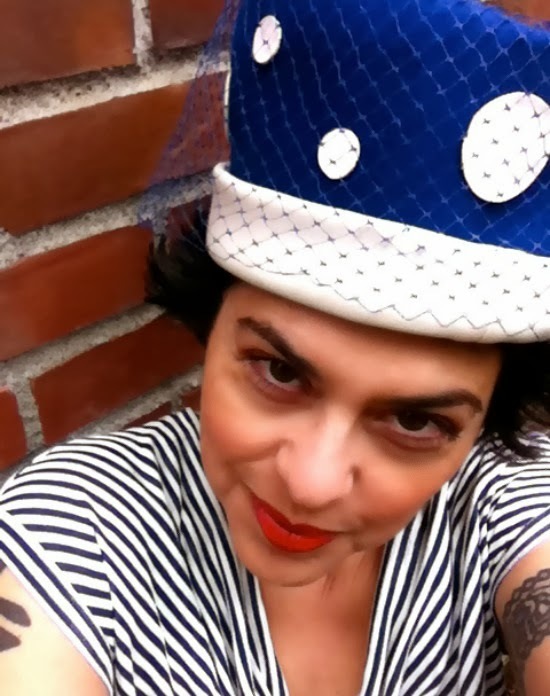 While this is probably more of a spring look, I'm enjoying my new-to-me vintage 1960s wool felt pillbox hat, a recent score from Trove Vintage. Isn't it a fun topper? It seemed a good fit with my navy/cream cotton t-shirt, a secondhand find from the Goodwill- what makes it extra special to me is the fact it is made in the USA. Of course, I don't mind that it is figure flattering and was purchased for a little under $10.The whole outfit felt first rate, and on budget. SHOPPING SECONDHAND FIRST: The items came from a variety of shops- from charity, thrift, consignment and vintage boutiques, but the one thing they all have in common- they are all secondhand sourced. So, 100% Thrifted. And 100% affordable. Boo-yah. Total cost of outfit comes in under $50 bucks. I'll be linking up to the lovely Style Crone for Hat Attack! Lovin those shoes!! Stay safe in all that rain, Bella!! Hi Bella! Love your hat! What fun!! Too Cute! I love the first pic. Really pretty. That hat is so awesome. I love the blue! what a fun hat yo! 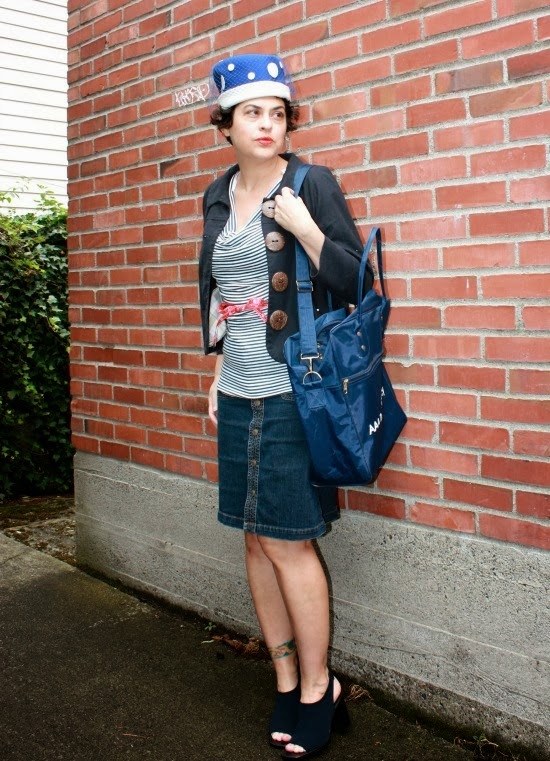 I dig your look with the rest of the bloggospher, dear Bella. lovely hat, and lovely pattern mixing, polka dots and stripes are a so fabulous combo! !, and you look so cool and pretty, every detail is genuine!, love that measure tape as a belt! Exquisite hat on you Bella. The color, the dots and you! I love the high crown of the 60's, and your outfit is the perfect combination of chic and second hand. Looking forward to seeing you in this topper on Hat Attack! 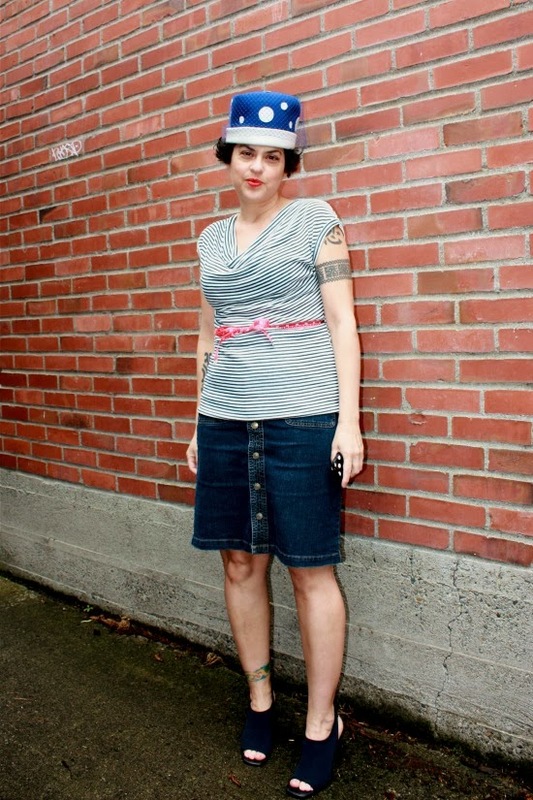 That hat - way to dress up a denim skirt! And you're right, the top is flattering (and looks comfy,too). But my fave is that jacket with the big buttons. I'm dotty over that one! Love that jacket, especially the gigantic buttons! I love everything about this outfit. The travel tote, hat, and big buttons are fantastic thrown together. But I love how you used the measuring tape as a belt. Very cool! Stay dry. 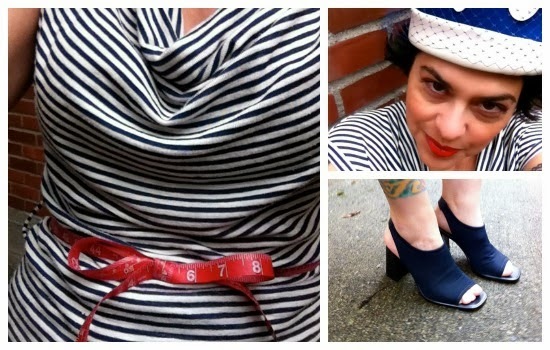 That hat was MADE for you Bella--i love how saucy it is with the striped shirt! That measuring tape used as a belt is genius! I love polka dots. It is a crazy hat. Reminds me of a kings crown.